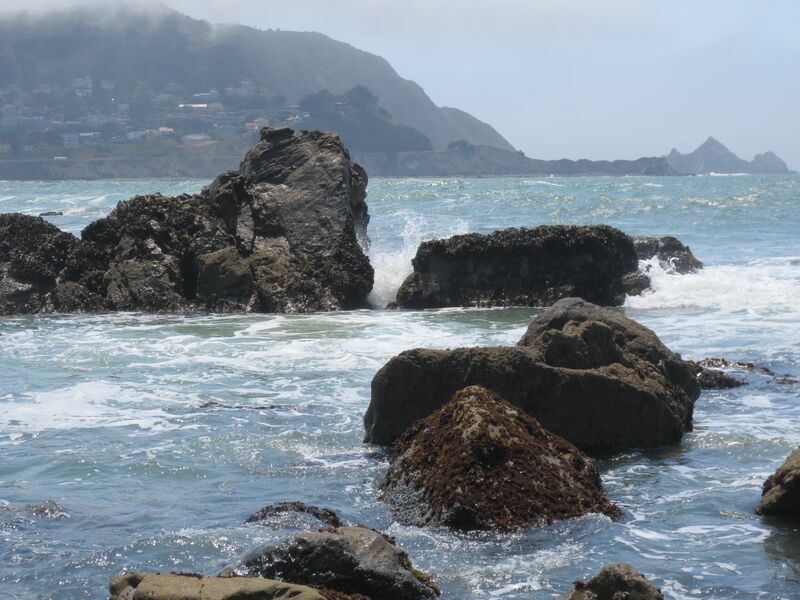 Not too far south of San Francisco on the Coast Highway, you come to Pacifica. A sleepy little town of 38,000 (well, it seems sleepy to big-city dwellers), it has three main beaches along its 2-1/4 mile coastline. If you start at the Pacifica Pier, you can walk south along Sharp Park Beach (bordering Sharp Park golf course), to the site of Mori Point Inn, built by Stefano Mori, an Italian immigrant farmer in the 1870s. The roadhouse was taken over by his son Jack, who turned it into a speakeasy during Prohibition of the ’20s, smuggling in boot-legged Canadian whiskey from offshore. The feds caught up with Jack in 1923, confiscating 24,000 cases of liquor and closing down the establishment. A steep flight of wooden stairs (now known as Bootlegger’s Steps) leads directly up to a high bluff overlooking the ocean, where you can walk along the coast toward Half Moon Bay. The uninterrupted view of the Pacific is breathtaking. If you don’t climb the steps, and instead turn left at Mori Point, you can walk along a restored wetland area at the end of the lake (Laguna Salada) that is the habitiat of the endangered California red-legged frog. I had ventured here a few times, but never saw a frog until I met some locals, who told me exactly where to look. The walk also encounters crows, gulls, unabashed squirrels, lizards, and lots of other wildlife. One of my favorite places to go for a brief get-away from the city is Linda Mar Beach in Pacifica. 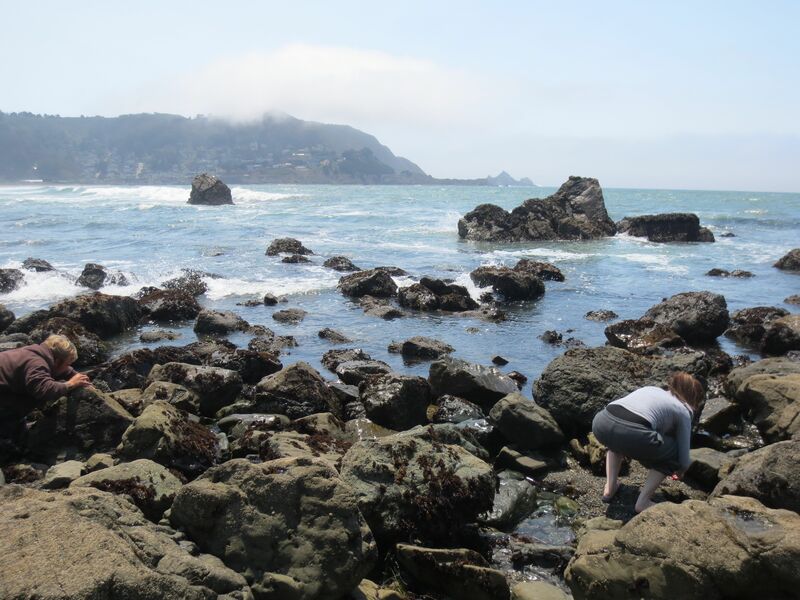 At the north end are rocks where, at low tide, you can see living starfish, mussels, sea urchins, pretty mother-of pearl shells, olive shells, limpets, and tons of tiny little hermit crabs running around in other creatures’ shells. 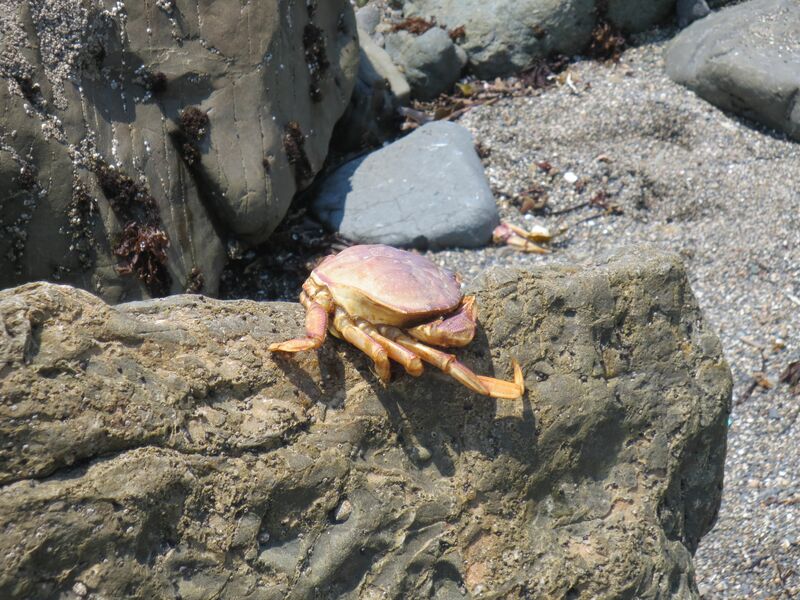 On our beach strolls, my family and I have often seen crab fishermen posted right along the beach, with their lines in the surf, fishing for Dungeness crabs. If they are under a certain size, they throw them back into the water, because there is a legal size limit to what they can take. It’s not uncommon to see one or two dead crabs along the shore, who, for whatever reason, did not make it back into the water. 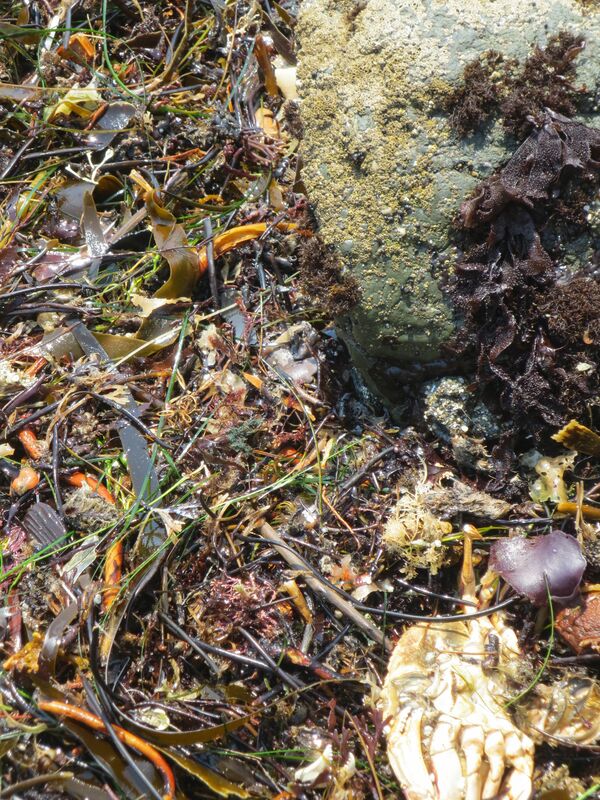 But last week, while tide-pooling among the rocks, my daughter and I noticed a dead crab sitting on a rock. It was about 5 inches wide, and had probably been placed there by another beach comber who had found it on the ground. 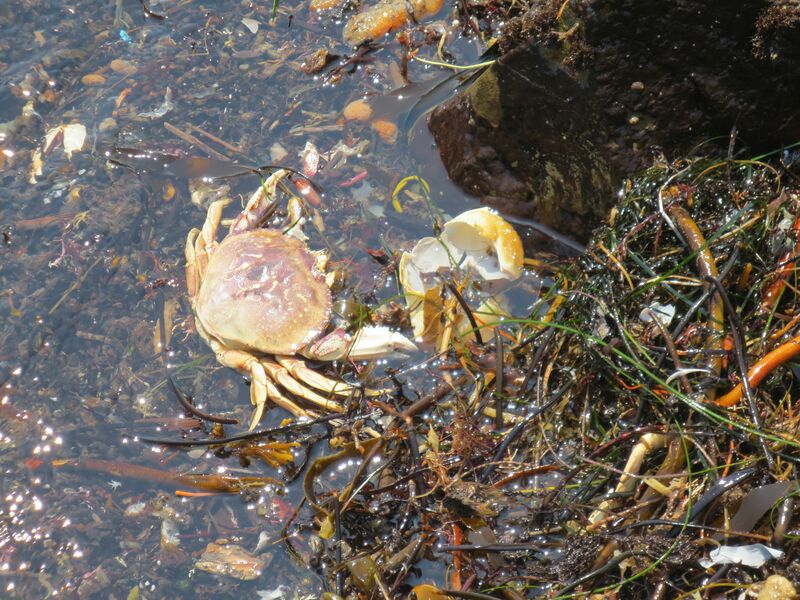 Then, as we started to search for the familiar tide-pool denizens, I noticed another, smaller, dead crab, floating in a tide pool, missing a leg. How sad, I thought. 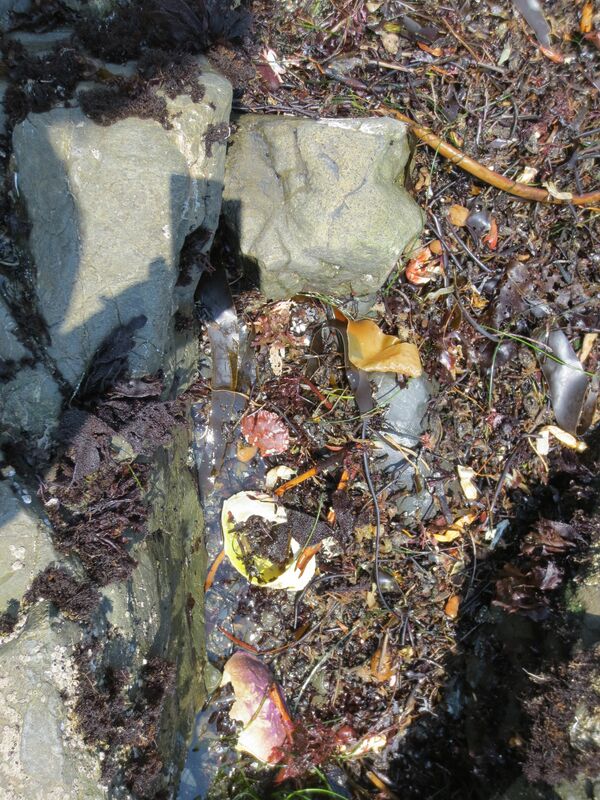 Then my daughter told me that there were a whole bunch of crabs in another tide pool. I went to look, expecting to see hermit crabs, but instead, I was shocked to find dozens of dead Dungeness debris littering the tide. The other animals seemed alright (except for a maroonish piece of what looked like dead jellyfish that sat on a rock). I saw a part of what looked like a pink star, partly obscured, under a rock. I was heartened to find myriads of my little hermit crab buddies scurrying around in the shallow pools. Lots of opened small mussel shells, iridescent blue and pink inside, evidenced that the seagulls had been eating well. I am still mystified about the preponderance of crab remains… was there a bumper crop of them that had been frenziedly fished, the plentiful rejects left for the gulls? Or is there something in the water that is toxic to them, killing them off by the dozens?